Here’s a fast and easy way to add a little fun to your Thanksgiving table. These cornucopia couldn’t be easier. You can easily make place cards for your table or use them as party favors . . . . Hmm – Maybe you should just make them for the “kid table” – then everyone will want to sit there! Melt the chocolate in a small bowl (Place in microwave for 30-40 seconds. Stir, continue to heat in 20 second intervals until melted). I used the paintbrush to coat the edges of the ice cream cones. (I tried dipping them, but since the edges aren’t even it didn’t work too well). Stand each cone in a juice glass to allow the chocolate to harden. If you are doing party favors – that’s it – just fill with candy. If you want to make the place cards, prepare small cards (about 1″ x 2″). You can hand write them, print them on your computer, or better yet, let you kids make them! 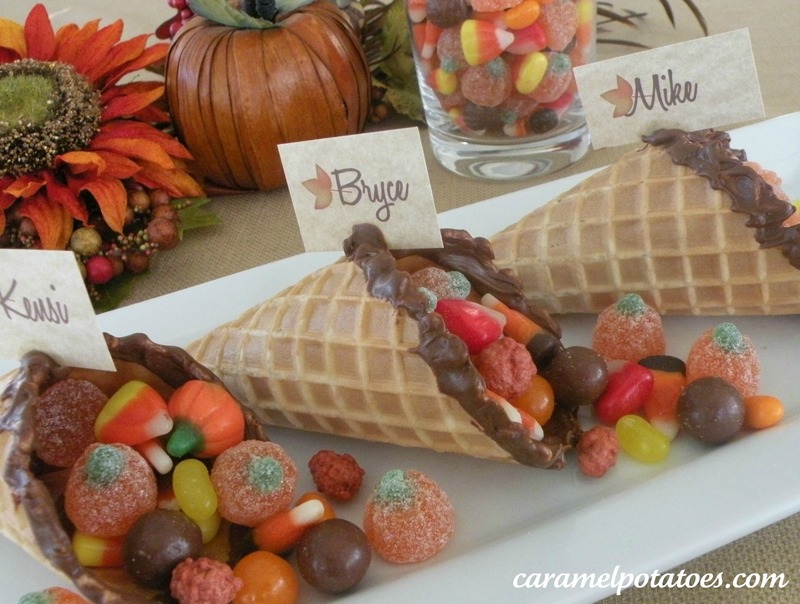 Lay the cone on its side and attach cards with a little melted chocolate. Once the chocolate has hardened, fill with candy. Easy-Peasy and so much fun! I do a similar cornucopia. For the past 30 years, I take regular sugar cones and dip them, one at a time, into a tall glass of water. I then put them in the microwave for 20 seconds. They are very bendable and I bend the bottom half up (into a cornucopia shape) and rest them against the side of a cookie sheet until they are dry. (Inside the cookie sheet.) I then fill them and place them on our table. My children always helped and now my grandchildren help. We wrap them in cellophane and tie a festive ribbon around them with name cards attached. It’s fun to have creative traditions in our family. Louise – Who knew you could bend the cones! Love this idea!! P.S. I’d love to see a picture if you want to email it to us! THanks for the idea! These are so stinkin’ cute! I’ll be featuring them on my site tomorrow! I hope you’ll stop by. These are just fantastic. Thank you so much for sharing your great ideas! Angela – I just do them the day before. Hopefully you’ll have some help. 🙂 Good luck – send us a picture!